We report two brothers of Cockayne syndrome (CS) with progressive growth retardation, microcephaly, bird headed facies with sunken eyes, cutaneous photosensitivity, retinits pigmentosa, sensorineural deafness, spasticity ataxia, neuropathy and intracranial calcifiactions. These clinical with radiological features of cortical and cerebellar atrophy with basal ganglionic calcification and presence of consanguinity in parents and chromosome studies showing sister chromatid exchange in less than 6% strongly supported the diagnosis of Cockyne syndrome and differentiated it from Bloom's syndrome and xeroderma pigmentosa. Without genetic analysis or tests for defective DNA repair, the diagnosis is mostly clinical. Status epilepticus complicating pregnancy is uncommon and may be associated with poor maternal and foetal outcome. We report a 24-Year-old lady who presented with refractory status epilepticus at 27 weeks of gestation. The underlying causes identified was extensive was extensive dural cerebral venous sinus thrombosis. 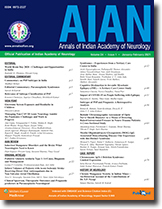 She required admission in Neurology intensive car unit and aggressive treatment including mechanical ventilation, anticoagulation and antiepileptic therapy with intravenous phenytoin, & midazolam and thiopentone infusion. She delivered a healthy baby after a spontaneous preterm labour 28 weeks of gestation. At the time of discharge, both mother and child were healthy. A brief literature review is also presented. Vitamin B12 deficiency usually presents with hematological or neuropsychiatric manifestations. The common clinical presentations include pernicious anemia, myelopathy (Subacute combined degeneration of the cord), myeloneuropathy, optic atrophy, dementia and psychosis. An uncommon manifestation of Vitamin B12 deficiency-acute onset mania-in a 25-years old man that responded to treatment is reported. Relevant literature is also reviewed. Low Back pain is a very common symptom affecting the general population, incurring a huge annual societal cost. In spite of this, it remains very commonly misdiagnosed and maltreated. The majority of benign chronic low back pain patients suffer from a combination of myofascial frozen back syndrome with or without an overly of psychosocioeconomic factors. Neural compression causes are less frequent. A though evaluation of the patient to select the most rational therapeutic approach is necessary. In majority of the patients, a well planned out rehabilitation programme is useful. Surgery is indicated in a minority with neural compression or spinal instability, motivation is essential as rehabilitation and surgery have a high failure rate in inadequately motivated patients with psychosocioeconomic dysfunction. Genetic aetiology has been proposed for both idiopathic epilepsy and dermatoglyphics. Hence, the present study has been undertaken to find out the existence of any correlation between dermatoglyphics and idiopathic epilepsy. Material consisted of 100 patients (58 males and 42 females) and 100 controls (52 males and 48 females). Patient's age ranged from 5 to 40 years and controls were between 18 and 25 years. Dermatoglyphics were obtained by painting method. Qualitative parameters observed were percentage frequency of fingerprint patterns (loops, whorls and arches,), patterns in hypothenar area/ interdigital are and flexion creases (Simian crease, sydney line). On comparison with controls, in males, with hands combined, loops (52.24%) and arches (7.93%) were increased and whorls (39.83%) were decreased (p<0.05). In females, with hands combined, arches (13.1%) and whorls (36.43%) were increased and loops (50.48%) were decreased (p< 0.03). Significant differences have not been observed for the patterns in hypothenar area /interdigital area and flexion creases. These dermatoglyphics features could be used as additional markers to evaluate patients of epilepsy. Psychogenic movement Disorders (PMD) may result from somatoform disorders, factitious disorders, malingering, depression anxiety disorders and less frequently, histrionic personality disorders. First recognized by Henry Head in early twentieth century, PMD s commonly encountered and clues to their differentiation from organic disease. A generally accepted management protocol has been outlined. The diagnosis of Duchenna Muscular Dystrophy (DMD) and Becker Muscular Dystorphy (BMD) is mainly based on clinical profile, serum CPK values, muscle biopsy and immunostaining for dystrophin. This was done in 100 unrelated patients using 19 exons including the promoter region in two sets of multiplex polymerase chain reaction (PCR). These primers amplify most of the exons in the deletion prone 'hot spot' regions allowing determinations of deletion end points. Intragenic deletions were detected in 74 patients indicating that the use of PCR- based assays will allow deletion detection help in prenatal diagnosis for most of the DMD/BMD patients. The frequency of deletions observed in the present study was 74%.